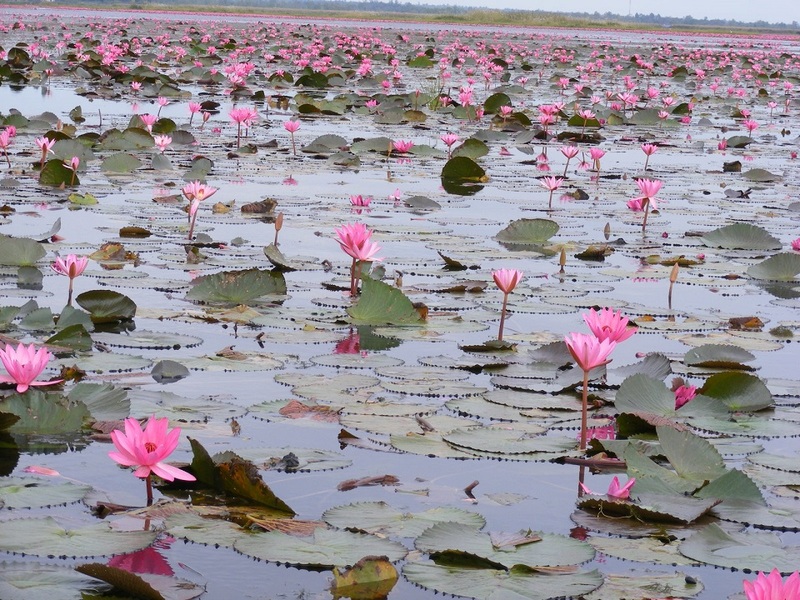 The Red Lotus Sea (although most of the flowers are more pink or crimson than they are red) is about 45km south east from the Udon Thani ring road, at Lake Nong Han on the banks of Ban Diam, in the Kumphawadpi Reserve. The beauty of the lake is best witnessed in the low season, between November and late February. The Red aquatic flowers begin to bloom in October, following the rainy season, reaching full bloom in December through to late January. The best time of day to visit is between 6.00am until around 10.00am. If the day is cloudy (as it was when I recently visited), a visit at any time should provide the best display as the blooms remain open when the sun is not bearing down on them. 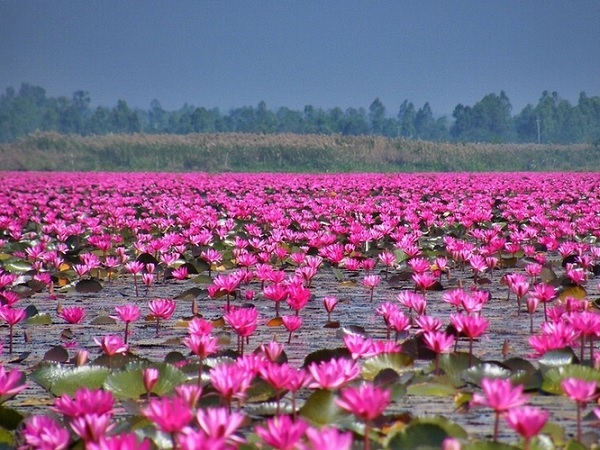 Other than the vast numbers of flowers present, the Red Lotus Sea also holds the position of the world’s second strangest lakes by Travel & Leisure. The lake covers a large area, (about 68 square kilometers) being 15km long and 5km at the widest point. The whole complex is typically Thai with no proper parking facilities in place, a host of food vendors on site to cash in on the visiting trade, and nothing catering for foreign visitors as such (the toilets are Thai too, so be warned). 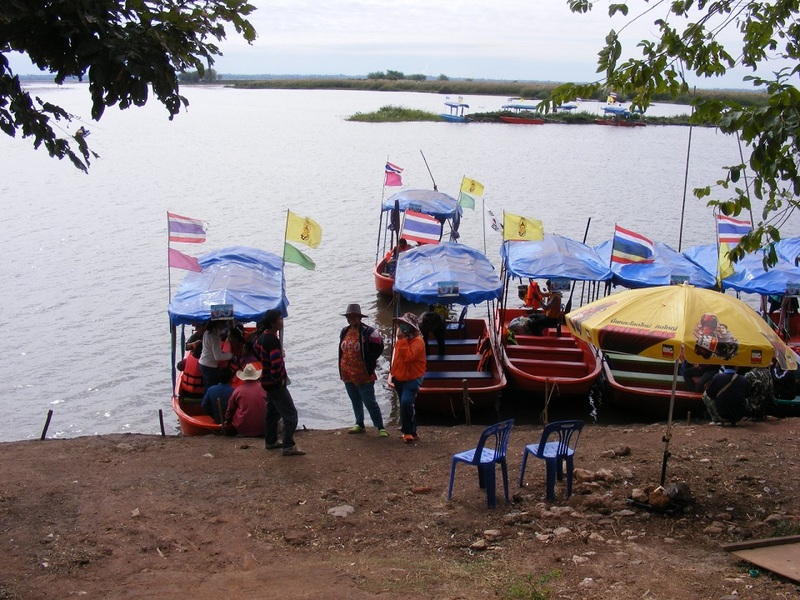 On arrival, you make your way towards the enormous lake and purchase a ticket for a boat trip at a small kiosk just before you go down some steps to what is called "The Port", where some 80 hard plastic, motor boats await to take you around the lake. 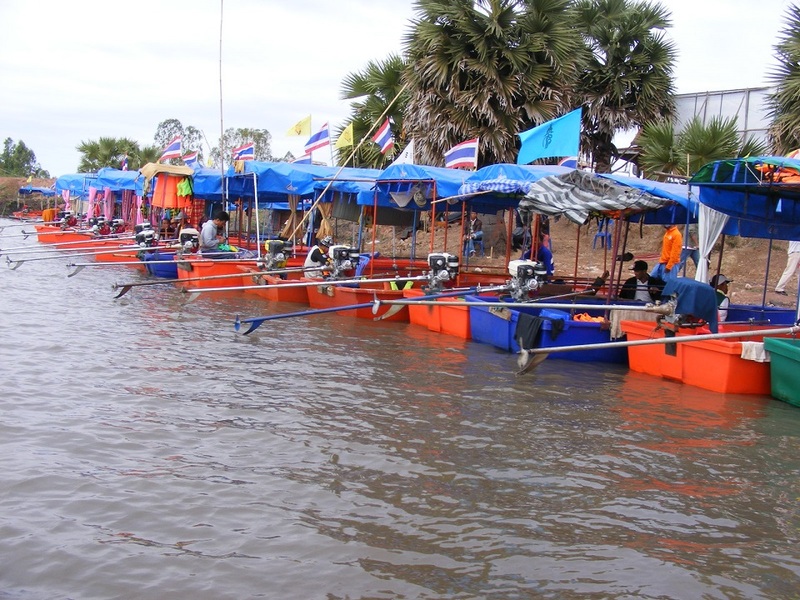 Tickets cost 300 baht per boat, with each boat capable of taking up to 10 people. If you go alone, it still costs 300 baht. 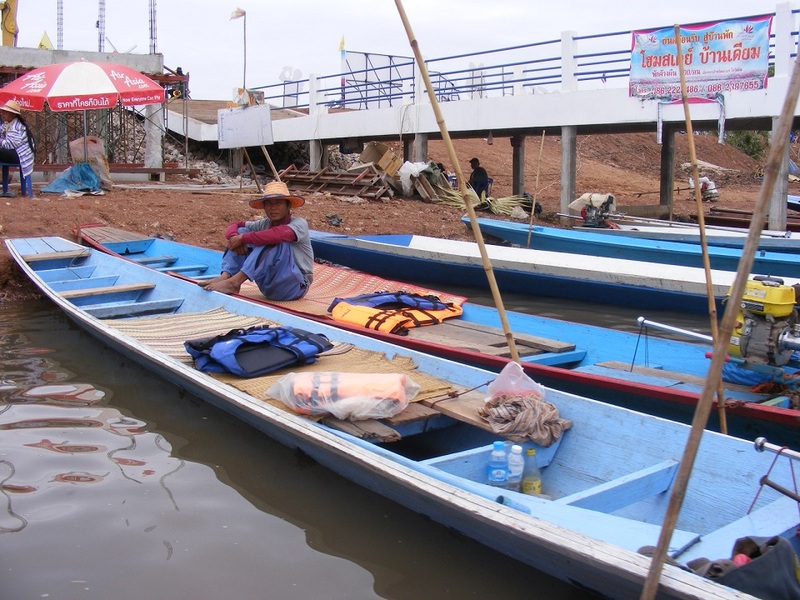 All the 10-seater boats have a canopy to cover you and protect you from the strong sun and rare rainfall at this time of the year, so the trip is comfortable enough. Hop on to the next boat in line and hand your ticket to the guide on board. There are life jackets on board each boat if you wish to wear one but the water is rarely more than 2 feet deep. The boat trip takes 45 minutes and it appears they have the timing down to a fine art, as the tour I took lasted exactly 45 minutes! Seeing the blooms by boat really is the only option, as you can see very little from the bank without a really good pair of binoculars. As we headed out, it became apparent very quickly, just how little bird life was on the lake. No water birds to be seen anywhere, despite the well made brochure indicating that Herons, Hawks and other water loving birds are present in numbers (see brochure below). Perhaps you need to arrive at day-break to enjoy the wildlife though I suspect you still wont see a large number of our feathered friends. 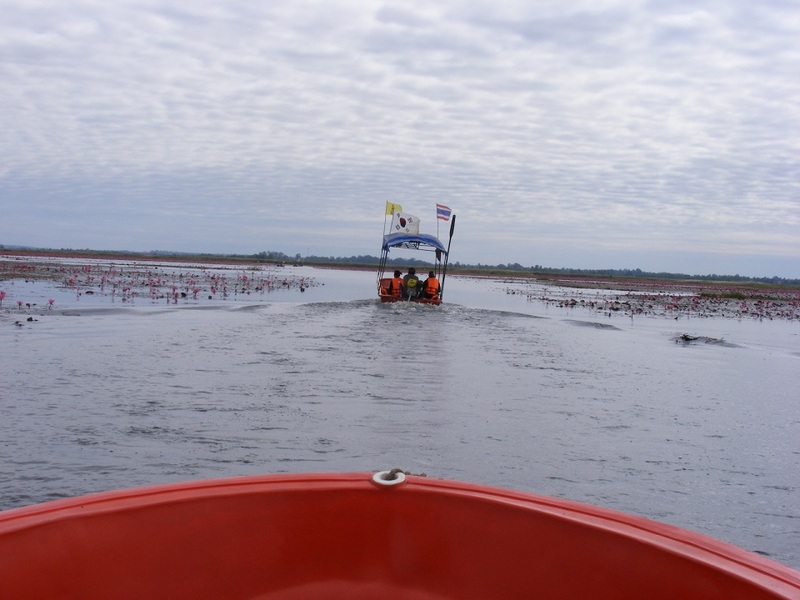 What also becomes very noticeable are the purpose built 'cuts' in the lilies, with channels for the boats to navigate and get you close to the flowers. Shortly in to your tour, your guide will slow down and 'park' in a small patch of the Red Lotus lilies, to enable you get close up pictures, and whatever else you want to capture. It was during this first of three stops that I also noticed a distinct lack of fish life below, and my guess would be that the lake has been fished dry over the years by the locals, as happens everywhere in Thailand. The Red Lotus patches were not as dense as I had hoped for, and indeed in some places were very sparse, but there were one or two patches that were beginning to look like the images you typically see to advertise the lake. Another feature, and one that I have never seen documented, was the number of birds (which looked like a variety of Swift) that seem to fly around the boats for pleasure. 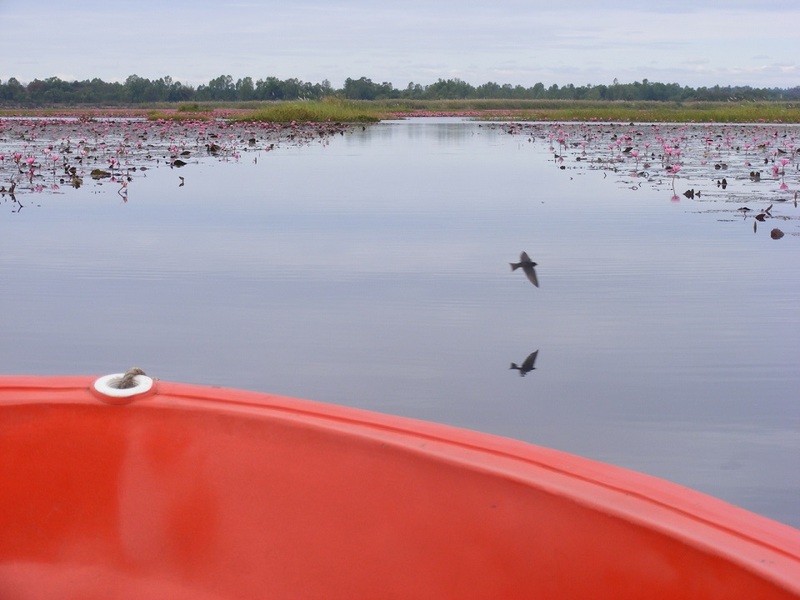 While the boat is moving, you will see perhaps 3 or 4 of these birds darting across the front of the boat, turn and dart back in the opposite direction, and they keep doing this throughout the tour, while in the lily patches. Even when the boat comes to a stop, they are still hovering around and playing their games. These lovely little creatures kept me entertained for most of the tour and the lilies took back stage to an extent, as I was trying hard to get a decent photograph of them. Finally I managed to get 2 decent pictures so was satisfied with my efforts. After spending the best part of 30 minutes in the Red Lotus patches, you head back to the shore. This final leg does not have a great deal to offer than the sight of the approaching 'port' where you began the trip. Once back on dry land, I headed off to a nearby restaurant to enjoy a meal and reflect on the overall complex. 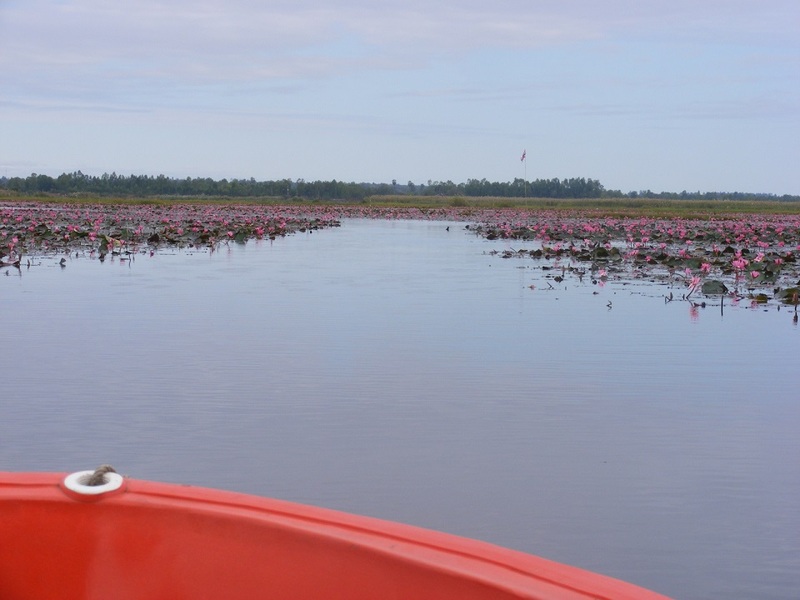 The Red Lotus Sea is certainly a popular location for the local Thai's and you are almost certainly going to see at least one Western or Australian visitor here during your visit too, as their girlfriend or wife drags him along for the day. It is worth visiting though you are unlikely to be here for much more than 2 hours as there is little else to do, although there is a nearby temple you could visit. There were more blooms to come, with a lot of the flower heads bobbing just below the surface of the water, so perhaps my visit this year, in mid-January, might have been a week or two premature, to witness a better display of lilies. All the same, it was a well-worth venture and an escape from the house for half a day. 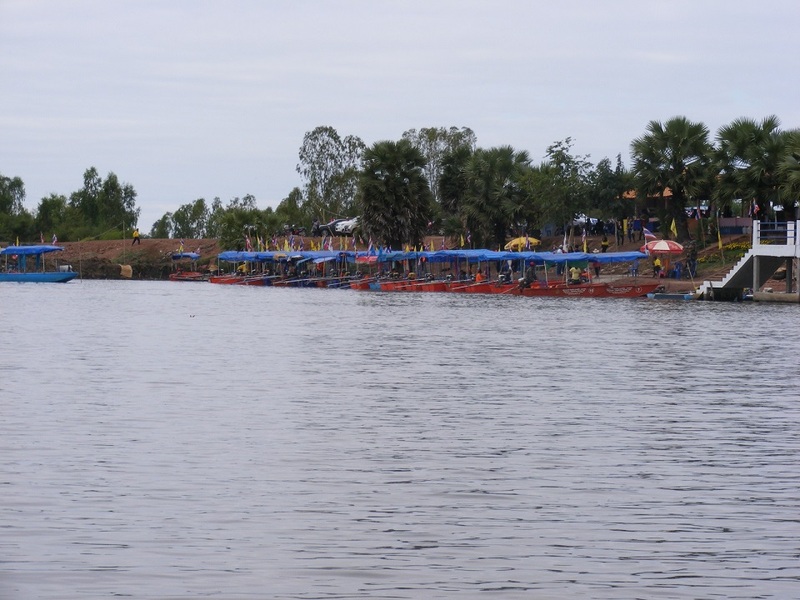 While there is a small villa complex nearby, it is not the sort of attraction that would hold sufficient interest for the average westerner to want to have an overnight stay, but many Thai's travel from afar to stay and wake early the following morning to get an early boat out. 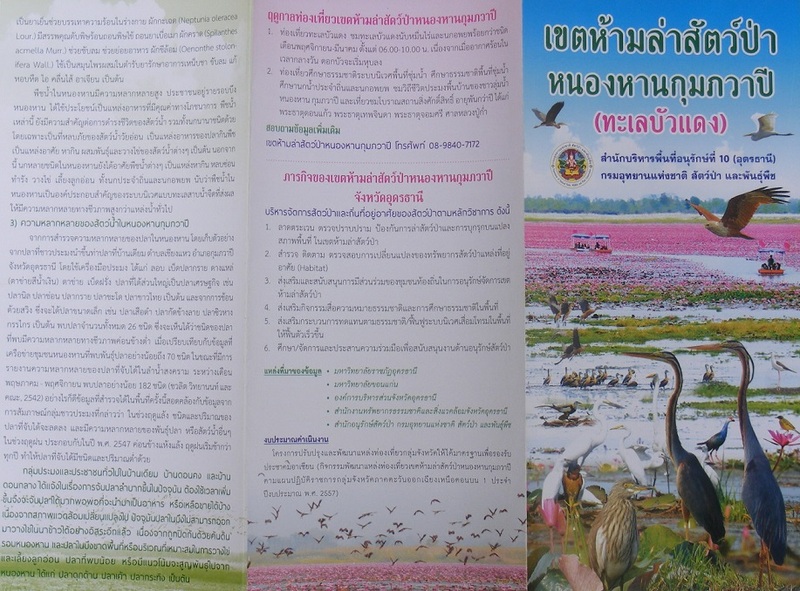 The Red Lotus Sea is one of the few attractions in the Udon Thani region that has a train station relatively nearby, at Khumpawapi​. It is then a 9km journey by road, if you can find public transport. 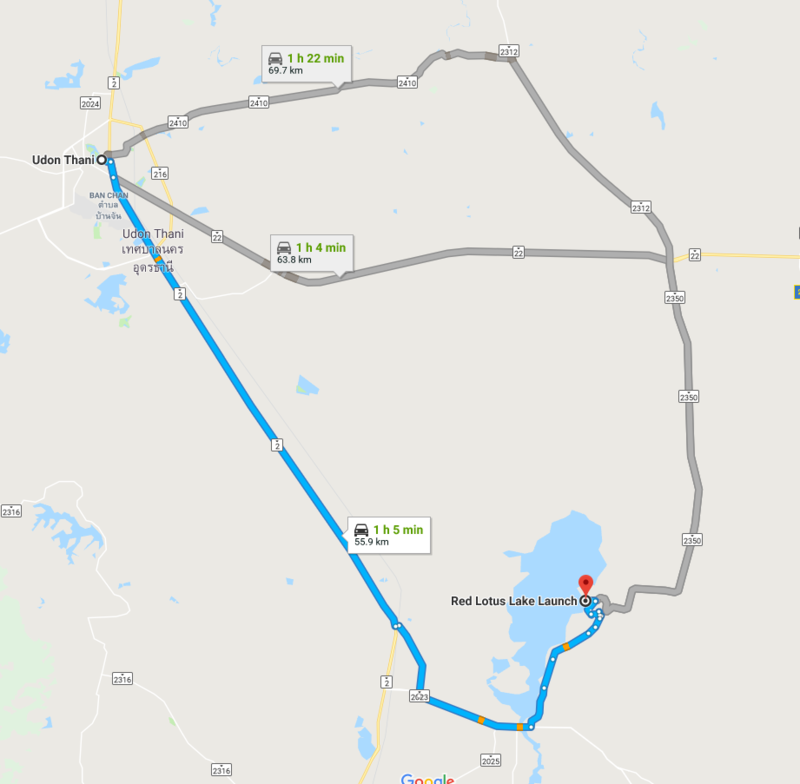 Most visitors travel by road which is easy from Udon Thani by taking Highway 2 toward Khon Kaen. At Thai Phian, turn left and follow the road signs.